Until fairly recently brussel sprouts were always boiled with salted water and served with a roast dinner. I have often cooked them in an Asian style also with beef and oyster sauce. Very delicious indeed! But a couple of years ago over drinks in the The Gore Hotel, London a friend asked if I had tried roasted brussels. I hadn’t but now I have and what a brilliant way to cook brussels it is! Now my inlaws being German always eat brussels rolled in butter and often with diced speck (bacon), which in itself is very nice, but roasted take them to another level! If you are using frozen brussels then usually there is no need to clean them up, but do defrost them first. If using fresh, peel off the outer leaves and give them a rinse. You can cut the brussels in half, but I usually just do them whole. 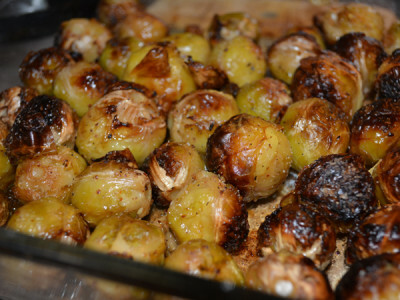 place the brussels on a baking tray and drizzle with olive oil, season with sea salt and crushed black pepper. Give them a good shake or stir to make sure they are nicely covered, then pop into a pre-heated oven 160°c for about 40 minutes. Have a look after about 20 minutes and give the tray a shake to make sure the brussels get a nice even roast. When they are done they will look brown and crispy, some even a bit charred, but that is okay, they will taste fantastic!